A LAN party is a group of usually three or more people who get together with their computers and enjoy multiplayer gaming with one another over a home network. These parties are usually accompanied by lots of computers, snacks, pizza (or some other cheap food), and a very unique gaming atmosphere. Generally, the success of a LAN party is dependent on how well you, as the host, are prepared. First, you need to make sure that you have enough space available to accommodate all of the gamers you are inviting. So, make a list of all of the people that are on the guest list and plan based on all of them coming, even though that is unlikely. But, it’s much better to have extra space than not enough. If you’re planning it at a house, you can split it up between floors if you need to. This may be necessary if you are inviting more than fifteen people. Once you know you have enough space to throw a LAN party, you need to know that you have plenty of long tables. Now, you may have to talk around with your friends and see if any of them (or their parents) have some long, wooden table that you can borrow. They can be expensive, so work this out before you sent out the invites and do not wait until the day before the party to try and get ten tables. As the LAN party network administrator, you should have an existing network of at least two computers in good working condition. I always test a bunch of LAN games over my small network to make sure that everything is in working condition. If you just want to “wing it” when your friends come over to play, you’re more likely to run into network issues. And that’s not good, because it takes up game time and is essentially a buzz kill at a LAN party. On top of having your existing network up and running, please do not forget to have a big network switch on hand. If a friend has it, that’s fine, but have them bring it over early so that you KNOW that it will be there. The ultimate nightmare of hosting a LAN party is not having enough ports for players to plug into. And, you don’t want to have to run out to the store and buy one at inflated retail prices. You may have to invest in one of these, but it’s a good investment as you’ll be able to use it for years to come. 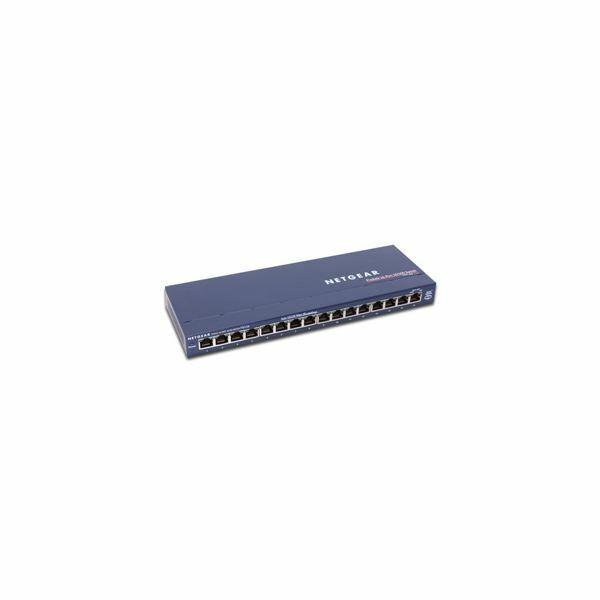 Here is the Netgear 16-port switch. As mentioned earlier, the real key to success is organization. If I’m hosting a LAN party with more than four people total, I write up an invitation that lists the time, date, address, and most importantly, everything they need to bring. There are a lot of things that each guest is responsible for bringing. PC Tower: Each gamer needs to bring their own PC. BYOPC – Bring your own PC is what you can put on the invitation. Each PC should be in good working condition with the games already installed and tested. Monitor: Now, I usually try to provide as many monitors as I can. Cheap, old CRT monitors work best for this, and like many of you, I have a ton of them just sitting down in the basement collecting dust. Bring those up and put them to good use. But, in the end, the best way to make sure that everyone has a screen is to have them bring it themselves. For many, that’s not a big deal because flat screen LCDs are so much easier to transport than their predecessors. Ethernet Cable: I have a bunch of ethernet cables, because for small LAN parties, I used to provide them. No big deal. However, if you have a larger LAN party, you should have everyone bring an ethernet cable. On the invitation, say something like, “If this is an issue for anyone, give me a call.” Then, if there are some that don’t have one, you can lend one of yours to them at the party. Peripherals: Everyone needs to bring their own keyboard, mouse, and headphones. With larger parties, it just doesn’t work for everyone to use speakers. Make sure it’s clear that they need some sort of headset. If you’re okay with speakers, at least tell everyone to keep the volume on low. On your invitation, have a list of maybe four games that will be played that night. There are free LAN games available, but some of the best games are the ones we all have to pay for. Everyone is responsible for securing his or her own copy of each game they want to play. List the games on the invitation so that they know which games they need when they come. Not much is worse than one person installing a game holding up the whole LAN party. If that happens, start the game without that person. It’s important to come prepared. Make a $10-15 cover charge for the LAN party. That’s not bad at all for five hours or more of entertainment, pop, and a meal. Most people will be more than willing to hand over a cover charge. I tend to gravitate toward the first method, but to each his own. If it’s just a few people, it wouldn’t be that expensive to order a few pizzas and drinks. For larger parties, a small cover charge is a good idea. When each person arrives on the big game night, try to keep a certain amount of structure to it. I usually allow the first people there to choose where they would like to sit. After that, it usually becomes necessary to direct your guests to their workstations. Take a few minutes to get each guest set up on the network. Make sure they are plugged in (avoid wireless gaming) and instruct them to join the network workgroup (HOME, MSHOME, or whatever it may be). I usually have a LAN game hosted as people are arriving so that they can try to connect to it to make sure that they are on the network. Some gamers will need more help than others. Chances are, if you run into issues, there will be at least another person there that can help you work through the problem. If this is your first LAN party, be assured that at some point there will be obstacles to overcome. The main thing is to stay calm and cool. It’s important to get the issues resolved, but you don’t want to freak out and kill the atmosphere of gaming and fun. Stay cool and people will want to come back for your next LAN party. DirecX 9 or DirectX 10 for MMORPGs, is the Upgrade Worth the Cost?